Great for commercial contractors or the DIY person looking to restore the original look of your log home/cabin. 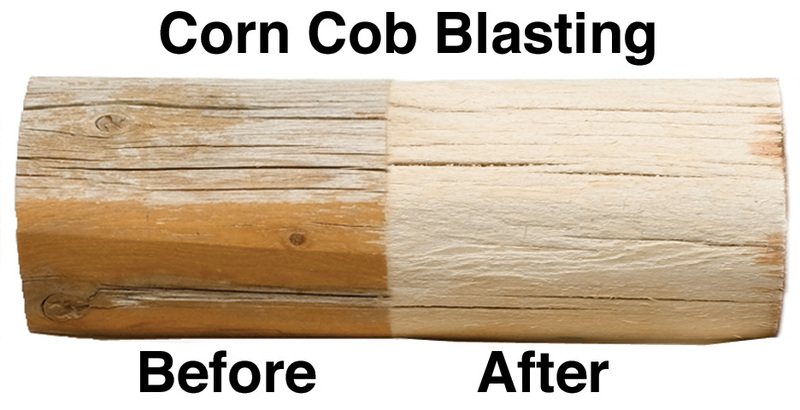 For professional stain removal and log home preparation, use the Kernel Corn Cob Blaster. It effectively removes stain and is environmentally safe. Stripping can be done in virtually any kind of weather, at any practical temperature. Standard Grit Corn Cob Media is available at 1,000 lbs (25 bags) for $500 with FREE SHIPPING. Why cant I just use a use a normal sand blaster with cob media? The Kernel has a built in moisture separator. Corn cob media has to be completely dry in order to work properly. If you try to use corn cob media with a normal sand blaster the media will get wet due to humidity and will not flow properly. Since water is not used, the surface can be coated with preservatives and stains immediately (if weather permits and after loose dust is blown or brushed away from the surface). This takes full advantage of a very valuable commodity: favorable weather! Please see the technical data tab for more information about the Kernel Blaster. We have developed the machine to use corn cob media. There are other types of media, namely walnut shells and baking soda, that have been tested in the Kernel machine. Sand is not recommended, it will damage parts of the machine, and can be hazardous to your health (see regulations section below). Walnut shell media is usually more expensive and more abrasive than cob media, but in your area it might be cost effective to use it. Baking soda works well, but will create more dust and damage plants if not cleaned up. Baking soda has also clogged our machine when humid. Baking soda will strip paint from metal if you ever find a need for it. There are a variety of corn cob grit sizes available, the sizes you will most often use are: 20/40, 40/60, and �40. 20/40 grit is a good, standard size, you will be able to remove most every coating, but watch that you are not doing too much damage to the wood. 40/60 grit is less coarse than the 20/40, and will work well on brittle coatings, but flexible coatings will waste too much material. �40 grit (the finest grit) is good for removing mill glaze or weathering (which all grit sizes will do), without raising as much grain as the coarser grit sizes. Watch for static electricity when using finer grit sizes. All grit sizes will raise the grain on the wood, but in general, the coarser the grit, the more "fuzzing" (which is not nearly as severe as the �felting� often experienced with power washing) and grain raising. Glass media can be run through the Kernel with no problems. Each state you work in will have different regulations on the use of abrasive media. Cob media is only regulated based on the nuisance dust it produces. Check each area you work in for the appropriate regulatory measures. Sand media is known to cause silicosis, and there are tight regulatory measures if you want to work with this media. You will need a 175-185 cfm (cubic foot per minute) compressor to run the Kernel at constant pressure. Start the machine with 60 psi of pressure, and increase as needed. Adjust the choke valve and the media valve to get a constant (not sputtering) flow. When it is running properly, the media will be slightly discoloring the air flowing from the nozzle. With the compressor running, open the valve at the base of the moisture separator until you hear air hissing out of it. Watch to see that water is dripping out of the open valve, you might need to open this valve more when working under humid conditions. Spray the wood like you would when spray painting. Keep a constant distance from the wood, and keep moving to avoid cutting into the wood. "Feather" the spray in and out of areas to keep a constant look. Always test an inconspicuous area before starting. Clean off the brass media filter every 5 bags or less if it is humid. If dry, you can go longer. The filters are cheap, and you might want to keep a few on hand. 1 bag of corn cob media will remove 150-300 square feet of coating, based on the type of coating. When finished blasting, close the media valve and blast any residue out of the checks and away from the home. A good shop vacuum will pick up a lot of the used cob media, and the material can be re-used if you filter it. Corn cob media won�t hurt the foliage in small quantities, but if you leave mounds on the grass, the media will absorb moisture from plants, so wet down (or have the homeowner soak) the grass when you are done. A good technique is to have one person waiting to fill the pot while another runs the machine. Running the machine on a hot day will wear you out, and you will want to switch duties every few bags.